The keyword here is realism. You want your drawings to feel like they are real, like they are snapshots of a scene that is actually happening in front of the viewer’s eyes. And in order to achieve this realism, we need to give our drawing depth. 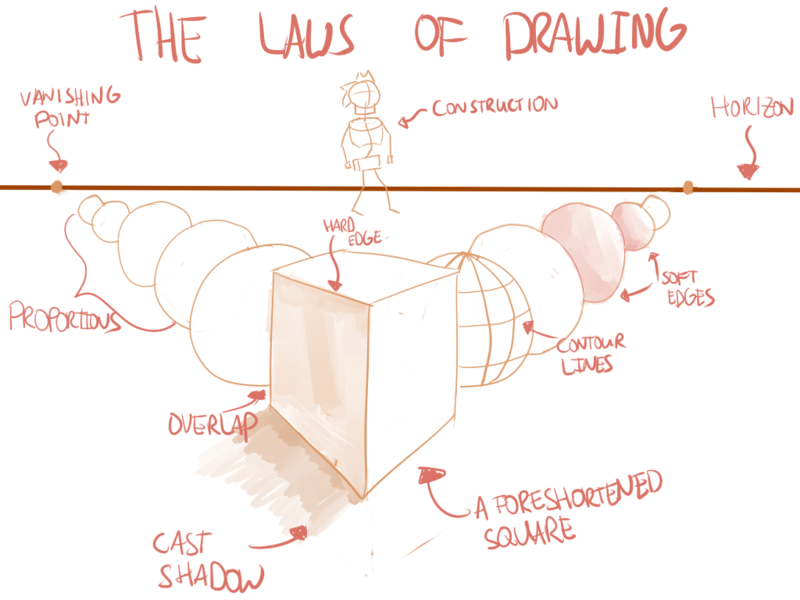 Our world is three dimensional, but our drawing has only two dimensions, which means we need some extra skill to create the illusion of that third dimension. Contour Lines. Imagine your lines as curves wrapping around the form of a 3D object, not simply as two dimensional stripes. Edges. Use the right type of edge to portray what you want. Foreshortening. Distort shapes to create the illusion that they aren’t flat. Overlapping. Overlap shapes to show one is closer to the viewer than the other. Construct. Use basic 3D shapes to construct your objects in a logical and realistic way. Proportions. Use size and proportional relationships to show the position and form of an object. Shading. Use light and shadow to show the form of a 3D object. Perspective. Use the elements of perspective, such as horizon lines, placement up or down the page, and vanishing points. Details. Use details – such as texture, colouring or density – to enrich the drawing even more. These laws aren’t placed in a random order; they are ordered from basic to advanced, and structured in the same way as this whole course. I’ll start with teaching you to get simple lines and curves looking right, and then continue to shapes, which leads to 3D objects, which leads to adding enrichment and details. Essentially, last sentence already describes the whole drawing process. You’ve already learnt everything you need to know! Now all I need to do is use the rest of the course to show you how to do it. Yes, it’s that simple. Test your knowledge with the quiz! What is the definition for using some rules to make whole scenes look 3D?